a book review by David Michael Slater: Where Are My Books? Where are My Books? is a mystery starring young Spenser, narwhal fanatic, bibliophile, and—after his beloved books begin disappearing from his bedside shelf—amateur sleuth. The book is very enjoyable to look at. The comic-style characters are appealing and expressive, and the brightly colored scenes are so roomy and welcoming as to invite the reader to climb right into them. 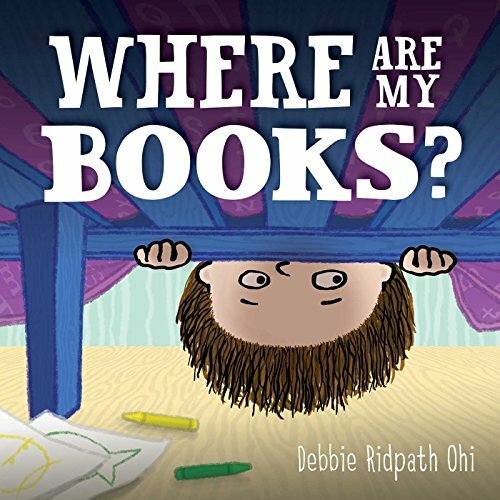 Debbie Ohi is a successful illustrator with a number of books under her belt, including the Judy Blume classics reissued by Atheneum, and according to her website, she has numerous projects in the pipeline. It’s not a surprise that her talents as an illustrator are in demand. However, it’s also not a surprise that this is the first book Ohi has authored because, as it turns out, the most mysterious thing about it is its leaky plot. Even allowing for this as a charming quirk, it’s rather alarming that his parents show no inclination whatsoever to take a break from their hobbies (dad’s gardening and mom’s birdhouse-building) to investigate when told their Type-A, book-obsessed child’s most important possessions have been inexplicably disappearing for six consecutive days—from his bedroom no less. Keen observers will have noted that in place of Spenser’s purloined books, tulip leaves and screws have been left behind. Are mom and dad torturing their own child? One presumes this is not a possibility readers are meant to ponder, yet they are invited to do so. After an ill-conceived attempt to accuse his baby sister, Spencer executes a clever plan that leads him to the culprits . . . squirrels. Squirrels who apparently just wanted to read his books. Perhaps fulfilling his destiny, Spencer decides to start a library so his new furry friends can have access to his treasures without stealing them, and life goes back to normal—better than normal it seems: the final illustration features Spenser reading to his sister surrounded by the squirrels. The kids’ surprised parents peek in from the hall. No explanation is offered regarding the screws and tulip leaves. Were the squirrels trying to frame Spenser’s parents? Regardless, Spenser has solved the caper and happily ever after is intimated. But readers with a need for order even remotely like our hero’s will be left clueless on many levels and thus dissatisfied with this mystery—no matter what time of day they choose to read it.